For year now, the Port of Belize and the Stevedores have been trying to hammer out a new collective bargaining agreement. The stevedores' representative which is the Christian Workers Union has gone through four presidents - and still there's no agreement. 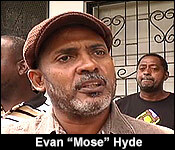 But the current President Mose Hyde says the buck stops with him. He wrote to the Labour Commissioner on Friday, telling him that the CWU, quote, "on behalf of its Stevedore Members, hereby invokes the twenty-one days notice to institute industrial action against Port of Belize Limited"
This comes out of a meeting last week Wednesday when the CWU claims the Port declared an impasse in the negotiations - after the CWU rejected the Port's hours of work proposal. A release from the CWU says, quote, "This refusal to engage on any other matter that remains on the agreed list is no less than extreme bad faith." Industrial action by the Stevedores would be a heavy blow to the Port - and tomorrow makes it 19 days notice remaining. The Labour Commissioner has not indicated if he will intervene. We hope to have comment from the port tomorrow. The clock is ticking on industrial action against the Port of Belize. The CWU set that into motion on Friday when it wrote to Prime Minister and Minister of Labour Dean Barrow, informing him that - on behalf of the stevedores - it's giving 21 days notice of industrial action against the Port of Belize. As you probably know, stevedores are the ones who clear off the ships - so without them - the Port of Belize would grind to a halt. It's a serious matter and one that came to a head last week when the Port of Belize simply refused to discuss anything other than the hours of work. That currently stands at 18 hours per shift - which is above the legally allowed 15 hours. 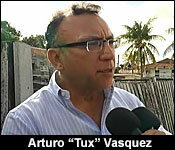 The Port CEO says he wanted to force that impasse in negotiations over that point:..
"You, in fact, forced the impasse. The union in its release or in the letter said that the port didn't want to talk about anything else. They viewed that as, I suppose, intransigent and unreasonable, and declared their twenty-one days' notice. You stand by that?" "The item of hours of work, which is where we are now, is something that from the very beginning, based on legal opinions both from legal minds and also from the labor commissioner, is to say that you are currently working outside the labor law. The labor law requires that you have at least nine hours. It doesn't say you will, it says you shall provide nine hours. That is not happening in the way that the stevedores are working. So, from 2012 we have been recommending a shift system to be able to keep us within the legal framework." "So, then, you all reached a point in the negotiations where you were deliberately inflexible?" "I am saying if you will only talk about hours, is that a good faith negotiation? That sounds like a hard ball negotiation." "Okay, first of all I think that if we want to do proper negotiations we both have to realize that it is wrong. That is the first point." "By wrong you mean unlawful?" "Yes, unlawful. So, if we can agree that we need to move to a shift system that is convenient to anybody, we can then negotiate. But, if your position is, 'I will not change from what we are currently doing,' for me negotiations are finished when it comes to that particular point." "From our point of view we have recognized that we are at an impasse, we have notified them that yes we are in an impasse, and we have also said to them, 'let us take the steps now, according to our negotiating framework, to get rid of this impasse,' and that means introducing a mediator. According to the act the minister has the option to consider and to say to us you apparently have an internal process that you can follow to clear your impasse. In relation to that impasse, the minute we went into an impasse we wrote CWU telling them, 'guys, we are at an impasse and based on our negotiating framework, we now need to agree on a mediator.' I am the employer, how long can I continue to insist that something is wrong for my employee? Have you ever heard about an employee telling an employer what to do? That is the situation I am faced with for the last five or six years. There has to be a stop to it. The stop has to be that if you won't listen to me, you will have to listen to somebody else. And I am hoping that maybe that is where we are now. You need to introduce a third party who will then say to both of us, 'this is what you need to do.'" Now, a strike at the Port of Belize would be a massive blow to the economy, seriously affecting the stock on store shelves, and the earnings from exports. But, the Port of Belize doesn't seem to be blinking. Vasquez said he's ready:..
"Do you feel under pressure?" "In a way but we have already implemented the system since Monday. We have already implemented the system. So, we are also preparing ourselves in the event that there is a 21 day strike because at least this time you know beforehand. So, we are already doing it. From security aspect, from an operations point of view, we are already doing it. Because everybody knows what the strike will cost and if you are at a strike then you haven't really settled anything. I think the whole idea here is, first of all, to settle the dispute first, the best way possible. That is the whole idea. The 21 day notice, the strike, will not settle a dispute." Both sides have been working towards a new collective bargaining agreement for over a decade. The CWU has said, quote, "This refusal to engage on any other matter that remains on the agreed list is no less than extreme bad faith." The clock is ticking at the Port of Belize where the stevedores gave notice of industrial action 5 days ago. 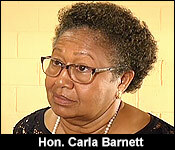 Today, after the Senate meeting, the Minister of State in the Ministry of Labour, Dr. Carla Barnett said she would be meeting with both sides and not making any pre-judgements:..
"I am preparing to meet with both sides. We will try to meet with them urgently. The 21 days has been invoked. So there are certain processes that you go through under the law under which they invoke that 21 days. So we are trying to keep the peace. We are trying to get them to talk. That's what we would want to do and if there isn't the possibility of talking then we have to move beyond that, because the port is an essential service. We have to keep it open. We have to keep the flow of good into and out of country. So we are prepared to work with both sides." "The Port of Belize CEO is saying that they had an agreement that if they do reach an impasse that they are supposed to move to mediation to appoint a mediator. Is this what you are recommending or is it just for them to continue speaking?" "I am not recommending anything at this time. We are preparing to meet with both sides and to see what a suitable way forward is. We need to do that. We can't jump ahead of the game. We have to meet with both sides and so before the end of the day today, hopefully we would have had that meeting with both sides." "Are you willing to pronounce on the hours of work, the sticking point?" "No, I am not. I know they've been in discussion over that for a long time and there is a feeling on one side that they will not back down and there is the feeling on the other side that they will not accept and so that's an impasse. Classic definition of a standoff. So we have to get into a discussion with both sides. I am not going to take a position with either side, because we have to be fair and we have to be seen to be fair and we have to listen." "Nothing about what the law says in terms of the hours of rest." "I am not going to pronounce at all. The objective at this time is to sit and meet with both sides and listen." 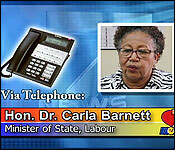 Up to newstime, Dr. Barnett told us the meetings were still ongoing. 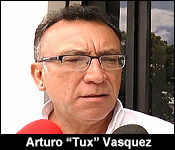 The Port of Belize willfully triggered that impasse over the issue of hours of work. They hoped to to activate the collective bargaining negotiating framework - which is when a third party is brought in to resolve an impasse. The CWU - which represents the stevedores - did not respond to that call for an impasse - and activated the 21 days' notice. 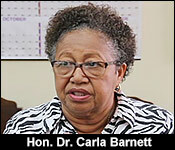 Last night you saw Dr. Carla Barnett, the Labour Minister of State, who said that she would attempt to break the impasse between the Port of Belize and the stevedores, represented by the Christian Workers Union. That’s because the clock is ticking down on a possible strike at Belize’s biggest Port. At this time, there is an impasse where the Port’s management disagrees with the number of hours that the stevedores work on a given shift. 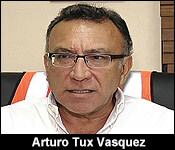 CEO Arturo “Tux” Vasquez says that they are breaking the labour law which says that employees should only be working 15 hours a day, with a 9-hour rest. He wants the stevedore gangs to implement a shift system, which the stevedores have rejected outright because they say it would substantially cut into their earnings. They say that those extended hours, is what feeds their families, and this shift system would leave them hungry. Both sides refuse to concede anything on this point, and last week Friday, CWU President, Evan Mose Hyde wrote to the Prime Minister informing the Government that the stevedores will take industrial action in 21 days. So for the past 2 days, Dr. Barnett has been meeting separately with both sides to get a clear understanding of the issues. This evening, after she had met with CWU and their negotiating team, the union and stevedores called a press briefing to announce that the main issue remains unresolved, and so, as far as they are concerned, the countdown to industrial action continues. Here’s how the CWU president explained it this evening. "We have met with the minister Dr. Carla Barnett along with her CEO and the acting labour commissioner twice, we met with them yesterday afternoon and we met with them this morning and they met with the Port of Belize negotiating team after they did with us yesterday evening and I believe that they are meeting with them this afternoon. The first meeting we held with them was basically a fact finding mission on the part of the minister where she asked us to basically layout how it came to this from our point of view. After meeting with both sides, she came to us this morning advancing ways forward for us to see if we can work this out. And what I can say now because we cannot get into a lot of details, I will say that we are still on our 21 day plan, we have not taken it off. Being a responsible negotiating team and union, we are participating fully with the intervention coming from the Ministry of Labour. We have said both in the negotiating’s and in the letter written thereafter that our position has been while it's obvious we have a diametrically opposing views on the matter of the hours of work proposal, that there are other items and matters for us to negotiate on and we have repeatedly asked for us to proceed on to those. The others on the other side have been adamant about not doing that. We have been told that they seem to have moved away from that position and might be willing to come back to negotiations but we are still not sure if they are willing to negotiate on items that we want to negotiate on. So we have indicated to the minister that, yes we will go back around the negotiating table but we want to speak about determination for our members. While the Ministry of Labour has gone to tell us that they have asked the Solicitor General to give a legal opinion on the matter of the hours of work proposal." "Essentially the stevedores don't work the way the traditional worker does his thing, 9 to 5 and like that. They work ships and there's one particular ship that they get to work every 8 weeks for extended periods of time; which earns them production bonus and overtime. This is the gravy ship, this is the rice and beans ship, it has fed their families, it has clothe their children and sent them to school. And so when you come and you propose, well not so fast stevedores, you might have been doing that all the while but you know what, you need to work under the law and you cannot work for those bonuses anymore. You are proposing something that anybody in the shoes of the stevedores would be immediately apprehensive about and would create significant trepidation. That's what we have, it's a fundamental change when all the while you know that when that BEC ship is coming, you will get your gravy now, production bonus times, good times. You go to work extended period of time, just like they do in Jamaica and other parts of the Caribbean but you do so once every 8 weeks. You get to relax after that before you have to do that again. So in our view, the law is not written to prevent workers from taking home revenues, the law is written so as to protect workers from employers who would want to abuse them. This is the ship that they depend on for their financial stability." "Sometimes it's better to use they lay term, we want to talk money, our members want to talk money. You understand because this is all money, at the end of the day it is all about money. They are worried about their bottom line, our members are worried about their pockets and we want to talk about money if we're going to go back around that table and hopefully we can get to that. So it's possible, I don't know how long the Sol Gen is going to take, it's possible that right now, the port has agreed to come around the table and talk money with us. And when we get around the table and we're talking money and we feel like, okay, you are talking money to us in a respectful manner and understanding our position, you see there is some outstanding benefits due to our members you see. 6 years’ worth of pay increases that no come yet. This might not be the thing whe deh wa have as right up there but for our members this is what we want to talk about brother. So I think we are hoping that we can engage and I have heard it be suggested and I have to say it again because it's easy to try to characterize people who are going on strike as if though they are being premature, they don't want to give and take. These brothers have sacrificed a man per gang, a man per gang. You know what that has caused in the ranks of stevedores? Just so that they can create an atmosphere where they can be a kind of good back and forth give and take. A man per gang means that 8 men, no longer benefit from the stevedore through, it means that a quarter million dollars, 250 thousand dollars that would have been in the pockets of 8 people per year in the community, is now in the pockets of the receivership. Man give and take, the record is there, the stevedores have been willing to do that." Last night you saw both sides of the labour dispute between the Christian Workers Union, which is representing the stevedores, and the management of the Port of Belize. The negotiations for a collective bargaining agreement between the waterfront workers and the port's management have reached an impasse. And so the Government, through the Ministry of Labour, has had to step in a try to resolve it as a mediator, so that the stevedores don't strike in 21 days. The dispute is based on hours of work. The Port wants the stevedores to stop working very long shifts - from the Port's perspective, it's against the labor law. The stevedores - on the other hand - welcome the long hours of work, because they earn more. Both sides aren't budging, so the Minister of State for Labour, Dr. Carla Barnett has been doing shuttle diplomacy to break the impasse. "When we became involved, it was clear that both of them are sticking hard and fast to their positions, and they still are. What we have asked to be done is to have the Solicitor General prepare a legal opinion on what the law provides because both sides are claiming that the law is on their side. And so, we have to have independent - and that's the role that we have to play - an independent legal opinion to the Ministry, that will advise us on what is legal, and what isn't. The Solicitor General will have that to us by Monday, the latest Tuesday of next week. So, this morning when we met, it was to convey to them what we have been discussing individually, convey to them in a joint setting where we are. It is important to note that both sides have agreed that they are willing and prepared to return to the negotiating table on the matters that are outstanding. They have a long list of things that they have been negotiating for the last 6 years. A good portion of those things, they have already agreed on, and they've already signed MOU's - interim MOU's that are in force, that have been implemented. So, it's the remaining things, and of the remaining things, the big things are the hours of work, and the remunerations. So, they've agreed that they are willing to return to the table to discuss the remaining things. What I explained to the group this morning is that under the settlement of disputes in essential services act, the minister is required to act in a certain way. One is to determine whether a dispute does exist, and we have agreed that there is a dispute, an impasse, that exists on the matter of hours of work, and that once we get our legal opinion - and we will meet again next Wednesday - once we get a legal opinion on the matter, if we cannot get agreement from both sides, then we have to send it to the tribunal, which we will establish under the essential services act, which will make a decision on the matter. And that decision will be binding on everybody." "What I said to both sides this morning is that we cannot take away from any union the right to strike. Government can't do that. Employers can't do. There is a right to strike that is entrenched in the law. So, we cannot take away the right to strike, but what the essential services act does is set out a process for proceeding to strike action. Once we send it to the tribunal, I would expect that the union would take that into account to determine whether or not they still want to proceed to strike. Because, if they do, then they're not waiting for the matter to be determined within the context of the law." "Do you get a sense that the dispute is cooling off, in terms of, we're closer to resolution? Or are the two sides drifting further apart in this dispute?" "I think that it's a really critical issue for both sides. It important for Port of Belize to put on the table that what they are trying to achieve is not necessarily a reduction in cost. So, they are prepared to receive from the union a counter proposal to what they have put on the table, to address any shortfalls that the union feels that their workers would suffer under a new system. So, one of the things that the union has also agreed to do is to come up with a counter proposal that would address any negative impact that their workers feel they would suffer under the system. And that would be in terms of in the pocket. And so, they have undertaken to do that. But, the union has been very clear - and they said it today - that even as they do that counter proposal, they are eliminating the right that they have to take industrial action, if they feel that it is progressing, is not one that is the realm addressing their concerns effectively." A press release from the Government of Belize says that all sides agree to meet next week Wednesday to discuss the legal opinions on the working hours issue. We'll keep following the story closely. 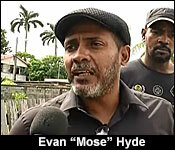 Time is ticking on a 21-day strike action notice for the Port of Belize. 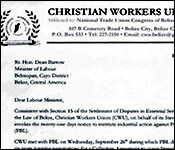 The Christian Workers Union - acting on behalf of the stevedores - sent the notice letter to the Government 12 days ago. The central dispute in this impasse is that the two sides cannot agree on the hours of work for the stevedores. The Port says that the law is clear that employees of this country should only be working 15-hour shifts with 9 hours of rest. That's in complete contradiction of the current practice of the stevedores, where they go on work-shifts that far exceed that 15-hour limit. The stevedores don't want to cut their hours of work because, less hours mean less pay, and if their salaries are cut, they won't be able to feed their families. 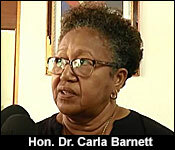 Dr. Carla Barnett, the State Minister of Labour, and her team have been trying to negotiate with the 2 sides, in the hopes of avoid industrial action. And, after meeting with each side multiple times last week, she was at least able to convince them both to resume negotiations on other issues that will make up the collective bargaining agreement, which has been delayed for many years. Today, Dr. Barnett held another follow-up meeting with the two sides to discuss the Government's legal position on the working hours dispute. We'll get to that shortly, but first we got a chance to interview Dr. Barnett via telephone today after the meeting. "Well we met today. The representatives from the port and from the union. We had a good meeting I think. At the end of the meeting the two sides agreed that they would come back to the negotiating table. Both sides were very strong, that they understood and they were prepared to return to the negotiating table. There are outstanding items to be negotiated and they want to complete the bargaining agreement. They agree to come back to the table next Wednesday. So next week Wednesday they will have their first meeting and at that meeting I expect they will discuss how they are going to proceed since the negotiations were put on hold couple weeks ago. So for me that's good news. The only thing about that is that the union needed to go back and discuss with the rest of its negotiating team, because one or two members weren't there. They just wanted to be sure that everybody was onboard. But based on how the meeting went I would expect that we will be seeing the two sides meet next week Wednesday." "We have offered and what has been accepted is for the ministry to have an observer in the meeting, in order to be able to advise me on how the meetings are proceeding, because the possibility of having to send the matter that precipitated the 21 days' notice - that matter is still to be addressed and depending on how effective they are in addressing that, we have to determine whether or not that still needs to go to the tribunal to be set up for the purpose." So, to the central issue itself, Dr. Barnett has told us that Attorney General Michael Peyrefitte's research on the topic says that basically the Port's position on the 15-hour workday restriction is right. Legally, workers in this country should not exceed a 15-hour work-shift, or else that is unlawful. But, there is an exception, because the labour laws does not contemplate the type of work that the stevedores engage in, and why their shift may need to be more than 15 hours at at time. We've seen a copy of AG Peyrefitte's legal opinion, and it says, quote, "The law also states that the Minister of Labour… is allowed to make exemptions… The Minister may…exempt… any undertaking, business or establishment, or…any class of workers. "I advise therefore that the Minister is empowered to make the exception in this case, as it relates to stevedores… This would allow stevedores to work the hours they want, and at the same time, absolve the PBL of any legal liability, as it relates to hours worked." "The legal opinion has determine that the labour laws does apply to the stevedores in respect of the hours of work, which means that under the present arrangement also, we've not been enforcing the law. The stevedores would normally and other categories of workers being limited to the 15 hours per day. But what the attorney general also said in the legal opinion is that the minister has the scope to determine an exception to those requirements. If there is a need to do that, I haven't determine that that is what I would want to do. I would want to have a discussion and see if they can come to an agreement on how they want to proceed." "What is interesting is the attorney general's ministry is also clear that the law that was put on the book was really not - it did not really contemplate the kind of work that the stevedores do. So it does not really apply to their scope of work and the way they work in many ways." "The legal opinion that the Christian Workers Union procured as well pretty much says the same thing, that this is what the law says, that you can only work for this period of time and you have to rest for this period of time. If you do otherwise you are working outside of the law. It was clear in that and it also says that in fact the law does not seem to provide for the kind of work that the stevedores do and so there is an issue that we have to sort out and we have to figure out the best way to do it. One way to do it is the way the attorney general pointed out to me which is to create an exception on the law and the other way to do it is to create a particular category or worker that would encompassed the stevedores. I am advised that other countries have taken that route, because stevedores do tend to work odd shifts and down shifts whenever we see them in other parts of the world." On this Friday, October 19th, the 21-days strike notice that the Christian Workers Union gave to the Port of Belize expires. At this time, it is still uncertain whether the stevedores and the CWU still intend to go ahead with their industrial action, but both sides have agreed to meet tomorrow. The dispute centers around a disagreement on the number of hours of work that the stevedores engage in on a regular basis. They often exceed the 15 hours of labour per day that the law stipulates. The Port wants the stevedore gangs to adopt a shift system to bring their hours of work in line with what the law stipulates. But the stevedores say this proposed change will hurt their earnings, since they will be working less hours. Last week, the Labour Minister of State, Dr. Carla Barnett, intervened successfully to get the two sides to agree to return to the negotiating table. Those talks resume tomorrow, and the the Ministry will have a representative acting as an observer. If the Port and the CWU are able to advance the negotiations, the dispute may be over, but if not, then the Ministry will have to convene a tribunal to settle the disagreement. In the meantime though, there is uncertainty about the 21-day countdown. When we spoke with Mose Hyde, the President of the CWU, he told us via messages quote, " Our 21-days countdown remains in effect"
We also spoke via telephone with Arturo "Tux" Vasquez, the Port's CEO, and he told us the Union has agreed to make a counter proposal on the hours of work, and as long as they do that, he is prepared to negotiate on all other points of interest for the collective bargaining agreement. So, the stage is set. Tomorrow's meeting will most-likely determine whether or not the stevedores go and strike, and we'll be there to tell you how it goes. 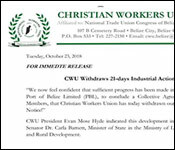 Tomorrow will make it 21 days since the Christian Workers Union gave three weeks strike notice. 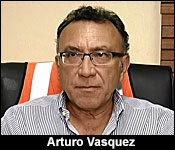 The Port and the Stevedores had reached an impasse in negotiations over the issue of the hours of work. The stevedores want to work shits exceeding 15 hours, the Port says it's against the law. The Labour Minister interceded, broke the impasse and got them to return to the negotiating table. They did so yesterday, and both sides emerged with positive views on the progress they made. It was looking like the dispute was on the way to being resolved without a need for strike. That’s until the Port and the CWU returned today to discuss the union’s counter proposal on a fix for the hours of work. 6 minutes after the meeting was scheduled to start, we saw the CWU President and the stevedores’ negotiating team exiting the labour office. They left early, citing a frustration with the latest position from the Port’s CEO. "We decided to leave the room because the other side, the Port of Belize limited, they are challenging the minister to get us to rescind our strike before he negotiates. The minister opened the meeting by stating she is going to extend our strike action 10 more days which she has the power to do. He is not comfortable with that, he is challenging the minister's position, that's between him and the minister. We are around a table, our time is as precious as the port's time, we asked, are we going to negotiate to which there was no answer. We have decided to leave the room, that's our position right now." Just as the CWU President and the stevedores were about to disperse from the Labour Office on Albert Street, the Minister, Dr. Carla Barnett, requested to speak with him, no doubt to convince him to return to the meeting. "It was just a little bit of a misunderstanding at the start of the meeting and I'm sure they'll both want to give you their own views on what happened. Sometimes it is not what you say, it is how you say it and I think there was a little bit of a difficulty in the way things were being put across the table and it required a little bit of a cooling off." "That simple sticking point could have caused today's negotiations or discussions to grind to a complete halt." "It could have I agree and again, like I said, I did not expect that the 21 days would have been extended. Obviously I did not expect that but again with the explanation I got, I am prepared to continue discuss it. I thought that once we had arrived at that compromise of saying we will exchange counter proposals for the hours of work, I thought the 21 days came off." So, that left the two sides to discuss the matters planned for the afternoon, and today’s meeting was rather brief, when compared with yesterday’s sessions. "We have presented them a verbal description of our counter proposal and a matter of hours of work. It was sent to them during the lunch time today, so they have asked for more time to look at it, so we are scheduled to meet on Tuesday morning about what they feel about our counter proposal. What we have said them that is very important for us when it comes to the hours of work, for us to get from them a sense of whether or not the direction that we are going with our counter proposal is a direction they are okay with because accompanying that verbal description of our counter proposal is the work that has to be done by our accountant. That's fleshing it out with numbers and that's going to take some time and we express to them the reason why it takes time is not because we are trying to be disrespectful to the process but if we make a wrong more, our members are the ones that will carry the burden of that. We can't make a single mistake with those numbers and our accountant has expressed that." "We also believe ultimately that we still seek that intervention from the Minister of Labor to create an exception for what's stevedores do. We believe it's a unique profession and we believe the nature of it requires that kind of attention from the law, so that is still a part of our counter proposal." "I’ve looked at it briefly and I believe some of it could be considered but some of it I'm sure we may not be able to consider but I'm not saying that now, he agreed that I got it at this time and I need some time to look at it. So we will meet again next week Tuesday morning." In the meantime, there will be no strike, at least for the next 10 days. That postponement of industrial action comes by way of the Minister’s intervention, exercising the powers given to her under the law. "We were in fact preparing to extend the 21 days by 10 days, so that we could proceed with the establishment of the tribunal that's provided for under the law, so that if it came to that, we would be able to activate that very quickly. 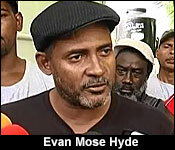 Today, we wrote both the Port of Belize and the Christian Workers Union formally telling them that we were extending the 21 days by a further 10 days, so that we could proceed to establish the tribunal required under the law and we also are sending off letters as we speak to the Chamber of Commerce and to the National Trade Union Congress, to identify representatives who can become a part of the tribunal that is to be set up under the law." "She has the power to extend our 21 days and so she has extended that 10 more days and our legal advisor has told us that she has the power to do so." So, while the 2 side try to resolve the hours of work impasse, there is foreshadowing of another major point of contention that’s brewing between the two sides. "We brought up a matter that is very important to us and we told the PBL negotiating team since yesterday they indicated that the gang composition was a matter they considered pending. Now you must understand for us that was very uncomfortable because our gangs have already been reduced by the intermediate agreement. So we don't view that as something that is spending, that's a matter where our stevedores have already sacrificed a man. Apparently they are of the opinion that we are to look at reducing our gangs even further and we have told them if there is anything that is made of titanium, it is that position. That even though we are here to negotiate, when it comes to the gang size, we will not move and so we have informed them that we will write a letter to the minister to indicate that we have another problem, we are not declaring an impasse on it but we are saying based on their response that they are firm on their position and we have told them that our position is made of titanium, then we want the minister to get that on her radar." "There was an agreement signed June of 2017 where there were 4 points that were agreed to and that's when the stevedores got their increase in their pension. From 3% of regular salary to 4% of production bonus, this actually multiplies the pension ten folds. So what I'm trying to explain to the union is that one particular item that we would have discussed a further deduction came as a result of a complete joint agreement. It was negotiating you get this, I get this, that type of thing and this is something that would be implemented in 2020 but the point I make again is right now we are at 2018, so it seems close but we actually did that in June of 2017, so we're actually looking at almost 3 years to look at this thing. So I think that because it is a part of the original give and take negotiation, I think it should remain on the table but of course I do appreciate the fact that Mr. Hyde was not around then, so he may not fully understand the give and take that we did then. We moved from 3% to 3 on production, then 4 on production and there was quite a bit there." As to the issue of backpay that the port owes the stevedores, both the Port’s CEO and the CWU president tell us that there is an agreement that the Port will pay them in 2 installments on November 15th, and 2 weeks later, at the end of the month. The two sides meet again on next week Tuesday morning. Tonight, the tension has eased at the Port of Belize because the Christian Workers Union this afternoon withdrew its 21 days' notice of industrial action. This is after a meeting between both sides today produced a breakthrough. "Today's meeting, very positive. I would say that we have moved a good ways. They got a chance to look at our counter proposal, and significant thing is that they are prepared, once we have done all the work with the numbers, to utilize the adjustments in the hourly rate to neutralize any earnings loss that our members are going to be faced with. And for us, that is a big issue." "The proposal put forth by the union, which is just the basis of the hours of work, not necessarily the detail, is quite acceptable, and we've looked at it. And I would say, 80-85%, 90% of it can be considered. Of course, some negotiation has to be done with it, but I believe that both parties are in agreement that that initial proposal is possible. Discussions can happen, and I think that we have made significant progress there." "But, even bigger than that is that they have agreed that they will be in solidarity with us in asking the Minister to make the exception for stevedores as a unique profession. So that, even though our counterproposal makes some adjustments, we still want it to be on the record that the stevedores are a unique profession, and so that whatever that final agreement is with the hours that we will work, and the ceiling on it, that we have flexibility in that. And so, that is an important position for them to take along with us." "It was first the suggestion - and it's a part of the proposal on the hours of work - where union is saying that they are prepared to work the 15 hours, as the law prescribes for. However, if there are circumstances, where, for example, if a ship is 36 hours, they would like to do two 18's, instead of breaking 15, 15, and a smaller - you understand. So, they were proposing to push it to 18. That's their proposal. I think that the AG had mentioned that changes can be made, however, I still believe that there are some limitations to those changes. But I'm not an attorney. It is for the AG now to determine whether he can actually make the changes that he said he could. We agreed to the 18, simply because, in my view, 15 hours and 18 hours is not much. I think that within a human capacity, that is still something within reason, and it is a far cry from 50 and 60 hours." "We have to get in touch with the Minister because we seek an agreement from her that they are going to put that exception that the stevedores are a unique profession. And that is important because, as I expressed to the PBL team, this is not a thing where you only negotiate one time, and then it's forever and ever. At some point, there's going to be an owner of the port, and it's possible - even though I said them I think it's gonna be very difficult to imagine a group more difficult than them - but somebody might come and want to revisit this issue and challenge our members on this. And so, having that in law is going to be very important for us." In a press release from the CWU, the President is quoted as saying, "We now feel confident that sufficient progress has been made in our negotiations with the Port of Belize Limited (PBL), to conclude a Collective Agreement for our Stevedore Members, that Christian Workers Union has today withdrawn our 21-days Industrial Action Notice." Now, that doesn't mean that all matters are resolved. You'll also remember that in our last interview with both the Port's CEO and the CWU President, they foreshadowed that even after this hours of work issue was resolved, there was potential for another major labour dispute to flare up between them. The Port was insisting that the stevedores and the CWU should be prepared to further negotiate the reduction of number of stevedores on the gangs that work the containers from the ships. The CWU and the stevedores were adamant that this would not happen. You'll remember President Evan "Mose" Hyde describing their refusal to reconsider this to be as strong as "titanium". "And then, even more significantly - well not more significantly because we thought would have been a potential impasse, the matter of gang reduction, the Port has said they are withdrawing that. So, they are no longer requesting for any gang reduction to take place." The situation of the gang size was always something that was to be negotiated, to be discussed. We gave it some consideration. We had a caucus, and we deliberated on it, and we believe that at this point, in order to assist the overall agreement, and moving forward, I think that it's best that we put that behind us for now. So, that's really what we did." Now, when we did this interview this morning, the CWU's stevedore members hadn't yet decided to withdraw the strike action - that came later this evening. "I would be lying if I did not say that this morning was a very significant morning in our negotiations, and now, we have to go and deliberate on what it is we have accomplished, and then make a decision on the matter of the strike." "Sir, but in principle, it seems as though most of the things have been resolved. So, there may no longer be a need for the strike. Would you agree or disagree?" "Well the same way that we determined the strike is the same we determine when to take it off. It's going to be based on our internal consensus, and then we move from there. We've given them the commitment that before 5 this evening, we are going to have a decision on that." "At the end of the day, the strike should be off the table, and maybe everything goes back to normal. I think, initially, what we would want also is for us to go really back to our own negotiations, with maybe not even having to have the labour commissioner sitting in the meeting as well, you know. So, I really feel like we are pretty close to that, and I believe we will know a lot more about that, before the end of today." Again, this evening, the CWU made the withdraw of the strike notice official when President Hyde wrote to Minister Barnett. The CWU press release highlights several of the progress made since they invoked the 21-day strike notice. Those include an acceptance by the Port of the CWU's counter proposal for the hours work. They say that it will include changes in the hourly rates that stevedores are paid, and a transportation allowance to offset any losses in stevedores earnings, due to the new shift. The Port has maintained that it could no-longer allow the stevedores to continue to break the labour laws which mandates that employees should only work 15-hour shifts. The stevedores were concerned that if the Port cut their hours down, then their earnings would suffer. It was a sticking point for both sides, who initially refused to budge, until the Labor Minister of State, Dr. Carla Barnett, and her team intervened. She got them to return to the negotiating table, which later led to them working out their differences. Also, the Port is no longer asking for the stevedore gang size to be reduced. Additionally, the port will pay stevedores all the back pay from 2015-2018, for salary increases which were due, but never took effect. Finally, the CWU says there is an undertaking from the Minister of Labour to establish stevedoring as a special class under the Labour Law, following joint lobbying by the Port and the Union. The release ends by thanking Dr. Barnett and the Labour Department for their role in helping them to resolve their differences with the Port.